Versatile back Benvenuti pulled on the Italian jersey at the 2010 Junior World Championships and made his debut for Italy in the November internationals. This followed after two stunning performances against Leicester Tigers and Perpignan for Treviso in the Heineken Cup where he scored four tries in the two matches. He is yet to cross the whitewash for Italy - though has six caps to his name - and started two of Italy's five matches during the 2011 Six Nations. 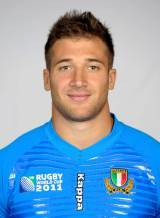 Benvenuti will go to the forthcoming World Cup with Italy.